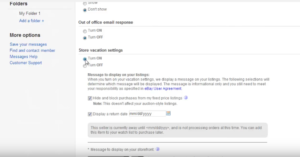 Here is a quick video to show you how to set the store vacation settings in eBay, so that you can temporarily stop selling items in eBay and go on for a vacation. 1. Click on My eBay at the top of the page. 2. On the page that loads, Click on Messages tab. 3. Go to the right of the page and click on Change Settings. 4. Scroll down the page that loads and find the area called Store Vacation Settings. 5. Select Turn ON option. 6. Some more advanced settings related to this feature will appear, you can customize these as you wish. Here we are opting to hide off fixed price listings. Further down the page you can enter a custom message that will be displayed on your storefront. Finally you can choose whether you want to auto archive any incoming messages. 8. And you will be told that the settings have been saved. Does this article help you? If you have any questions, just give a message and we will be glad to answer it for you?